Research Note: Not found in 1891 Census. [S2] GRO Indexes to Births. "GRO Online Index: 1855/Q3 PASK, Charles Benjamin REYNOLDS Bethnal Green 1c 211." [S2819] Image of the 1901 Census for 126 Well Street, Hackney, London: RG13 Piece 232 Folio 32 Page 55. Indexed incorrectly under the name of PACK. [S659] Image of the 1871 Census for Bethnal Green, Middlesex: RG10 Piece 474 Folio 74 Page 36. [S337] 1881 Census for London. Full details upon request: FHL Film 1341090 PRO Ref RG11 Piece 0415 Folio 117 Page 59 (Indexed under the name PARK). [S3] GRO Indexes to Marriages. "1878/Q4 PASK, Charles Benjamin = HARRISON, Mary Ann E Bethnal Green 1c 761." [S5011] Website London (LMA) Marriages & Banns 1754-1921. [S5548] Image of the 1881 Census : Piece 0415 Folio 117 Page 59 (Indexed under the name of PARK). [S4] GRO Indexes to Deaths. "GRO Online Index: 1896/Q4 PASK, Mary Ann Eleanor Bethnal Green aged 42." [S2800] Transcript of the marriage of Thomas Garner and Caroline Pask, 29 February 1908. Kindly provided by David Horwill - GOONS Marriage Challenge. [S4] GRO Indexes to Deaths. "1905/Q3 PASK, Charles Benjamin Bethnal Green 1c 138 age 50." [S4] GRO Indexes to Deaths. "1928/Q1 GARNER, Caroline Hackney 1b 629 aged 63." [S3] GRO Indexes to Marriages. "1878/Q4 HARRISON, Mary Ann E. Bethnal Green 1c 761." [S4] GRO Indexes to Deaths. "1894/Q2 MANCHEE, Charles Bethnal Green 1c 126 aged 32." [S3] GRO Indexes to Marriages. "1908/Q1 PASK, Caroline = GARNER, Thomas Poplar 1c 682." Caroline Pask Age: 43 Estimated Birth Year: abt 1865 Spouse Name: Thomas Garner Spouse Age: 42 Record Type: Marriage Event Date: 29 Feb 1908 Parish: Saint Mark, Victoria Park County: Middlesex Borough: Tower Hamlets Father Name: Robert Leigh Spouse Father Name: Thomas Garner. Children of John PASK and Harriett BISHOP née ? [S1183] E-mail from Tony Cairns to Stuart & Teresa Pask dated 25 March 2005: Descendancy Narrative. [S1755] Copy of the death certificate of John Pask, who died 6 August 1868. Kindly provided by Susan Keefe. [S384] Website FamilySearch Internet (http://www.familysearch.org) : Batch: M001612. 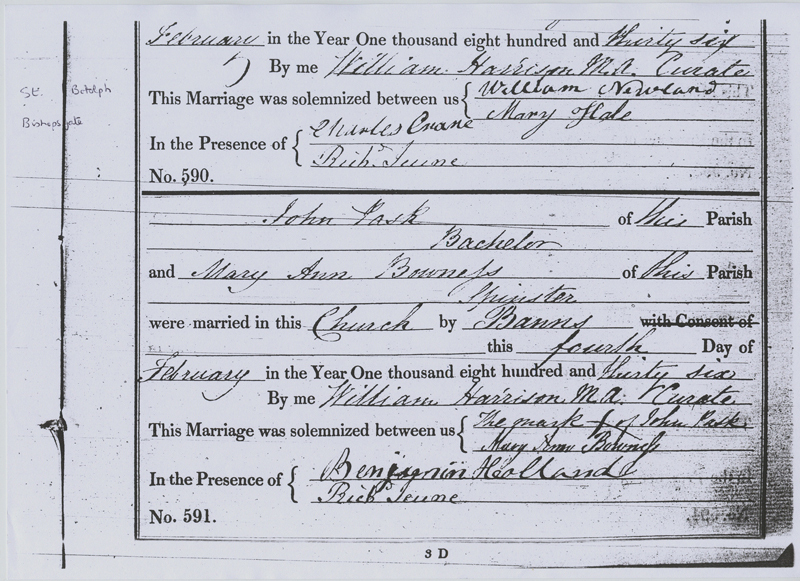 [S2578] Copy of the marriage certificate of John Pask and Mary Ann Bowness, 4 February 1836. Kindly provided by Sue Keefe. [S949] E-mail from Susan Keefe to Stuart & Teresa Pask dated 2 July 2007: LMA St. Botolph, Bishopsgate - Frances PASK born 6 January 1837, baptised 12 Feb 1837 daughter of John and Mary PASK of 6 Skinner Street, occupation Shoemaker. [S949] E-mail from Susan Keefe to Stuart & Teresa Pask dated 2 July 2007: LMA St. Mary's Whitechapel - Margaret Sarah PASK born 3 August 1838, baptised 26 Aug 1838 daughter of John and Mary Ann PASK of 100 Petticoat Lane, occupation Shopkeeper. [S949] E-mail from Susan Keefe to Stuart & Teresa Pask dated 2 July 2007: LMA St. Mary's Whitechapel - Emma PASK born 7 August 1840, baptised 30 Aug 1840 daughter of John and Mary Ann PASK of 100 Middlesex Street, occupation Shopkeeper. [S4] GRO Indexes to Deaths. "1852/Q2 PASK, Mary Whitechapel 1c 219." [S4] GRO Indexes to Deaths. "1868/Q3 PASK, John E. London 1c 5 age 62." [S4] GRO Indexes to Deaths. "1894/Q3 PASK, Harriett Mile End 1c 298 age 64." 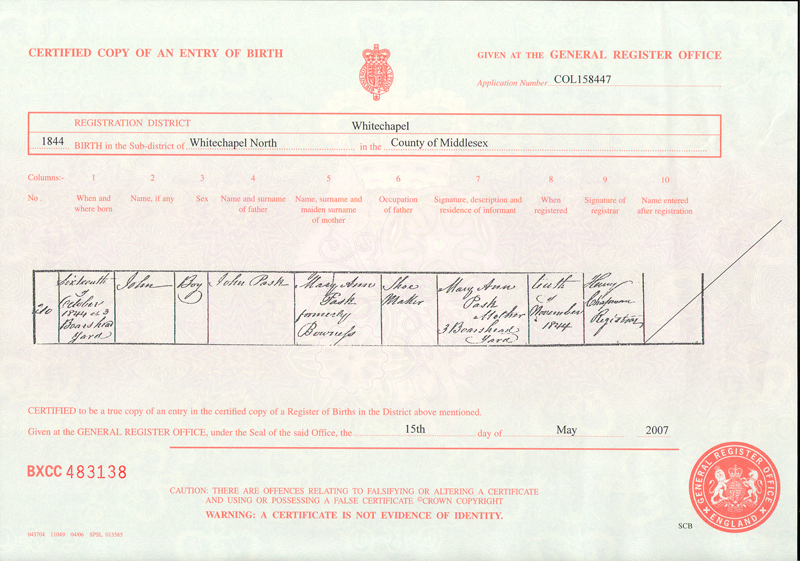 [S2580] Copy of the birth certificate of John Pask, born 16 October 1844. 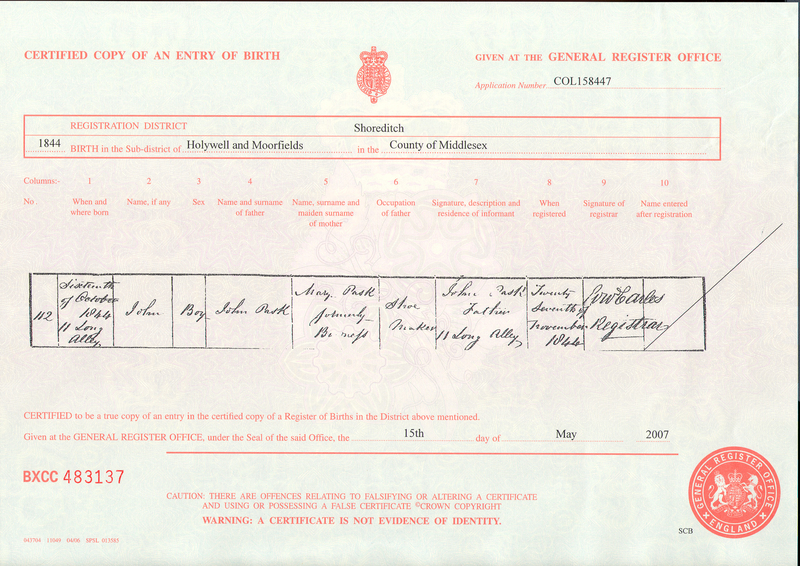 [S2579] Copy of the birth certificate of John Pask, born 16 October 1844. [S1757] Image of the 1871 Census for 4 White Rose Court, Bishopsgate, London: RG10 Piece 0416 Folio 46 Page 31. Indexed incorrectly under the name of PUSH. 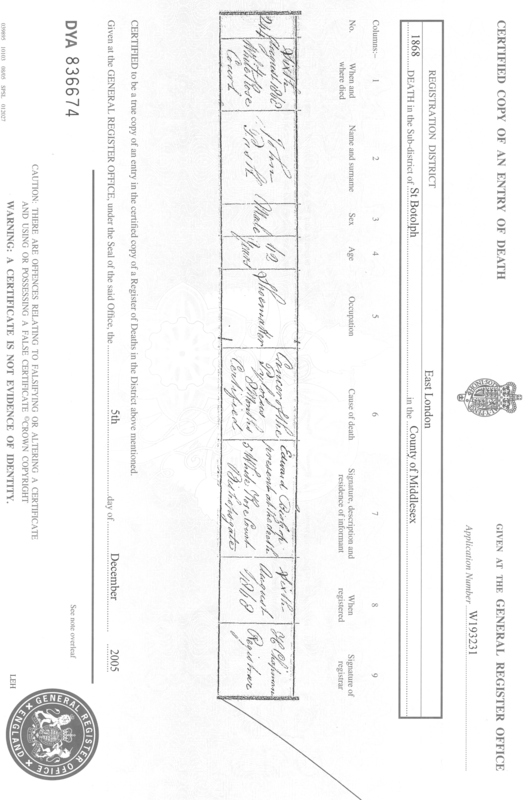 [S1155] Copy of the marriage certificate of Joshua Pask and Jane Rebecca Harley, 7 June 1919. Kindly provided by Susan Keefe. [S27] Website National Burial Index (NBI) @ FindMyPast (www.findmypast.co.uk: ) 9 May 1852 Mary PASK 40 City of London City of London, Tower Hamlets Cemetery. 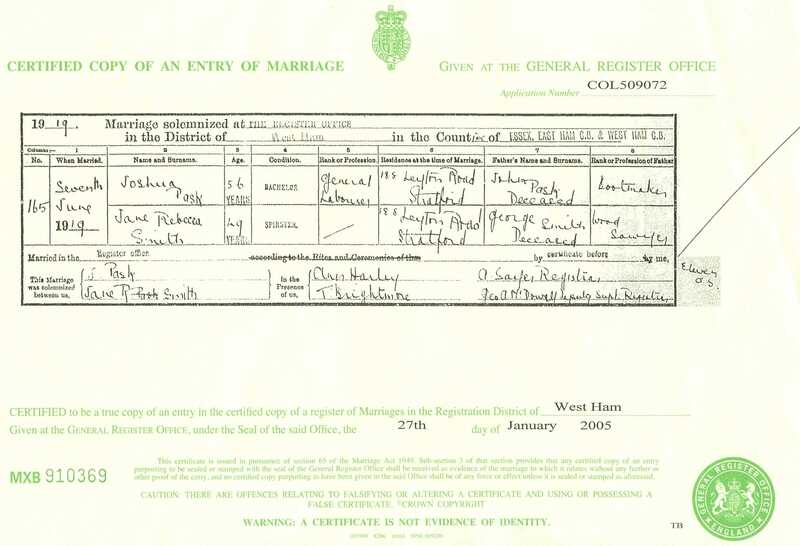 [S285] Website FamilySearch Internet (http://www.familysearch.org) : England, Marriages, 1538–1973 , index, FamilySearch (https://familysearch.org/pal:/MM9.1.1/NKNF-X97 : accessed 12 June 2012), James Pask, 1840. [S4588] Transcript of the marriage of James Pask and Caroline Panting, 12 October 1840. Kindly provided by Sian Plant & Team - GOONS Marriage Challenge. [S3] GRO Indexes to Marriages. "1840/Q4 PASK, James = PANTING, Caroline St. James Westminster 1 83." [S6] Teresa & Stuart Pask's Guesses, Theories and Speculations: He married Mary Ann REYNOLDS in 1852. [S342] E-mail from Liz Cooke to Stuart & Teresa Pask dated 29 February 2004. [S3499] Online Index to the 1911 : "RG14PN19473 RG78PN1164 RD412 SD4 ED5 SN71." [S4272] Image of the 1911 Census for Thetford, Baston, Lincolnshire: RG14 Piece 19473 Schedule 82. [S4] GRO Indexes to Deaths. "1955/Q3 PASK, Harry Bourne 3b 52 age 74." [S4] GRO Indexes to Deaths. "1966/Q3 PASK, Elizabeth S. Bourne 3b 57 age 80." [S454] E-mail from Peter Plant to Stuart & Teresa Pask dated 2 August 2004. [S2] GRO Indexes to Births. "1908/Q3 PASK, George Alfred Bourn 7a 369." [S2] GRO Indexes to Births. "1909/Q3 PASK, Hilda Mary Bourn 7a 362." [S2] GRO Indexes to Births. "1912/Q2 PASK, Dorothy COOKE Bourne 7a 685." [S2] GRO Indexes to Births. "1914/Q1 PASK, Phyllis COOKE Stamford 7a 635." [S2] GRO Indexes to Births. "1917/Q2 PASK Archie A. COOKE Bourne 7a 546." [S2] GRO Indexes to Births. "1919/Q3 PASK, Mary A. COOKE Bourne 7a 508." [S2] GRO Indexes to Births. "1922/Q4 PASK, Joseph COOK Bourne 7a 585." "Independant; a house called Lletty'r Deryn occupied by William PASK, farmer; the Reverand David THOMAS, James PASK, John PASK, Isaac PASK, William PASK, James POWEL; No 244. (Endorsed 1817, August 27)"
[S343] E-mail from Paula Payne to Stuart & Teresa Pask dated 28 September 2003: Need to continue research and confirm this. [S343] E-mail from Paula Payne to Stuart & Teresa Pask dated 28 September 2003 (His age given on the death certificate was 84. In attendance at the death was Mary Powell of 5 Barrs Street). [S343] E-mail from Paula Payne to Stuart & Teresa Pask dated 21 January 2008. [S845] Letter from Pat Maybrey to Stuart Pask, dated 15 November 2004 Newchurch Baptisms: 1765 9 Sep Isaac PASGC, son of William & Jane PASGC. [S343] E-mail from Paula Payne to Stuart & Teresa Pask dated 2 March 2008: Baptism record from Newchurch parish register 1765. [S343] E-mail from Paula Payne to Stuart & Teresa Pask dated 28 September 2003. [S343] E-mail from Paula Payne to Stuart & Teresa Pask dated 31 December 2006: Research Notes. 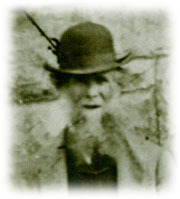 [S2911] Website Monmouthshire Grooms (http://freepages.genealogy.rootsweb.com/~monfamilies/… ) Isaac Christchurch Mary Holmes Christchurch Christchurch B 13/03/1786. [S343] E-mail from Paula Payne to Stuart & Teresa Pask dated 13 June 2010: Isaac Pask & Mary Holmes were married at Christchurch Parish Church on the 9th March 1786. [S3139] Image of the 1841 Census for Landevaud, Llanmartin, Monmouthshire: HO107 Piece 745 Book 16 Folio 2-3. [S4] GRO Indexes to Deaths. "1846/Q2 PASK, Isaac Bristol 11 119." [S3161] Website Llanmartin Parish Record Transcripts (http://freepages.genealogy.rootsweb.ancestry.com/… ) Burials: Isaac Pask, otp 4 Jul 1846 84. [S384] Website FamilySearch Internet (http://www.familysearch.org) : Film Number: 455134, Submitted by a member of the LDS Church. [S384] Website FamilySearch Internet (http://www.familysearch.org) : Batch Number C033591. [S3161] Website Llanmartin Parish Record Transcripts (http://freepages.genealogy.rootsweb.ancestry.com/… ) 114 13 Mar 1792 Isaac s/o Isaac Pask. [S285] Website FamilySearch Internet (http://www.familysearch.org) : Film Nr. 447844 Ref. 16776. [S3161] Website Llanmartin Parish Record Transcripts (http://freepages.genealogy.rootsweb.ancestry.com/… ) 133 29 Dec 1799 Ruth d/o Isaac & Mary Pask. [S285] Website FamilySearch Internet (http://www.familysearch.org) : Film No. 455134. [S3161] Website Llanmartin Parish Record Transcripts (http://freepages.genealogy.rootsweb.ancestry.com/… ) 138 16 Jan 1803 Wm S/o Isaac Paske. [S2711] Baptism Registers Indexed transcript, Cwmcarvan, Monmouthshire, Baptisms 1696, 1725 - 1810 "24 Apr 1754 Chas s/o Wm & Mary Pask." [S781] E-mail from Pat Maybrey to Stuart & Teresa Pask dated 7 November 2004. [S3074] Baptism Registers Indexed transcript, Llanvihangel Yestern Llewern, Monmouthshire, Baptisms 1725-1798 "14 April 1732 Wm s/o Isaack Pask." [S2911] Website Monmouthshire Grooms (http://freepages.genealogy.rootsweb.com/~monfamilies/… ) Pask William Llangwm Mary Edwards Llangwm Llangwm B 03/04/1755. [S384] Website FamilySearch Internet (http://www.familysearch.org) : Marriage of William PASK = Jane HARRY 26 JUN 1759 Wolves Newton, Monmouth. [S446] E-mail from Clive Hill to Stuart & Teresa Pask dated 21 December 2004. [S2911] Website Monmouthshire Grooms (http://freepages.genealogy.rootsweb.com/~monfamilies/… ) Pask William Wolvesnewton Jane Harry Wolvesnewton Wolvesnewton B 26/06/1759. [S845] Letter from Pat Maybrey to Stuart Pask, dated 15 November 2004 Newchurch Burials: 1783 31 Dec William (Mynddbach). [S1010] Digitial photograph of William and Jane Pask's Grave in Newchurch Cemetery. Kindly provided by Clive Hill. [S845] Letter from Pat Maybrey to Stuart Pask, dated 15 November 2004 Newchurch Baptisms: 1768 24 Jul Thomas son of William/Jane PASCE. [S845] Letter from Pat Maybrey to Stuart Pask, dated 15 November 2004 Newchurch Baptisms: 1773 27 Jun James son of William PASKE. [S845] Letter from Pat Maybrey to Stuart Pask, dated 15 November 2004 Newchurch Burials: 1775 2 Nov Mary daughter of William/Jane PASK. Research Note: The assumption is that this is the wife of William, however her age is suspect, as she appeared to have her children in her 40-50s. There is no other Jane in this time period. Research Note: The families of Jane HARRY and Jane COWCUM may have been mixed up. [S845] Letter from Pat Maybrey to Stuart Pask, dated 15 November 2004 Newchurch Burials: 1805 16 Nov Jane, 86. [S343] E-mail from Paula Payne to Stuart & Teresa Pask dated 13 June 2010. [S343] E-mail from Paula Payne to Stuart & Teresa Pask dated 12 April 2008: The baptisms of Isaac Pask & Elizabeth Stephens (later Pask) from Caerleon Baptist Church records, but they were baptised at Carrow Hill which is near Caerwent. [S343] E-mail from Paula Payne to Stuart & Teresa Pask dated 16 February 2008. [S2475] E-mail from Kay M Hodges to Stuart & Teresa Pask dated 28 February 2006: Marriages solemnized in the Parish of Caerwent in the county of Monmouth, Isaac Pask of the Parish of Llanveches, bachelor, and Elizabeth Stephens of this Parish, spinster, were married in this Church by Banns 14 May 1814. A copy of this marriage was given to me by Melanie Dodds of Caerwent and is in my possession. entered by Kermit L. Hodges 15 May 2002. [S2475] E-mail from Kay M Hodges to Stuart & Teresa Pask dated 28 February 2006: Resource: Film 0104166 Newport Branch, see also Abercarn,Newport and Varteg Branch record of members1848-1857 Newport Branch, Herfordshire Conference. Page 22 #246 Isaac Pask occupation Mason birthplace Lenfeolyn,Mon., (?on spelling) age 60 was baptized a member of The Church of Jesus Christ of Latter-day Saints, by Wheelock 14 July 1850. Ordained an Elder 28 Jul 1850 by W. Roberts entered by Kermit L. Hodges 22 Feb 2001. [S2475] E-mail from Kay M Hodges to Stuart & Teresa Pask dated 25 February 2006: RESOURCE: film 0104191,Hamlet of Llandevaud census of 1851, taken on night of 30 Mar 1851 states: Isaac Pask head age 60, mason, Elizabeth,wife age 54, daughter Rebeka Hodges age 20,James Hodges son in law age 22. (note, Rebeka and James were living with Pasks,awaiting the birth of their son James on the 20th April 1851) I have spelled Rebeka the same as it was recorded on the census record. This information added by Kermit L. Hodges 20 April 2002. [S1864] Image of the 1851 for Llandevaud, Monmouthshire: HO107 Piece 2451 Folio 27 Page 9. [S1742] Image of the 1861 Census for Llandervaud House, Llandervaud, Monmouthshire, Wales: RG9 Piece 4014 Folio 15 Page 7. [S4] GRO Indexes to Deaths. "1864/Q1 PASK, Isaac Newport, M. 11a 129." [S2475] E-mail from Kay M Hodges to Stuart & Teresa Pask dated 25 February 2006: RESOURCE:Film 1565721 item 54 and 56 From Bethany Baptist, Llanvaches, Monmouthshire, England, B8 Headstone:In memory of Issac Pask of the hamlet of Llandevaud who died 14 Feb 1864 age 71 years. Also Elizabeth wife of afore said died 22 May 1871 age 78 years. Also Rebecca Hodges daughter of afore said died 21 May 1865 age 34 years. (note:The certified copy, application number R006856 from the General Register office at Abergavenny in the county of Monmouth, copy of death entry clearly states 25 April 1865. and also the death date shown on hospital records shows 25 April 1865. )( Rebecca was buried 21 May 1865.) I checked with a Funeral Home to see if this was possible and they replied that it was common to take this long for a burial and that the body could be preserved for that length of time but would not be advisable to view the remains. [S4] GRO Indexes to Deaths. "1865/Q2 HODGES, Rebecca Abergavenny 11a 37." [S2475] E-mail from Kay M Hodges to Stuart & Teresa Pask dated 28 February 2006: Resource: Film 0104925 parish of Llandevaud, burial of Isaac Pask, age 73 years,17 Feb 1864. entered by Kermit L. Hodges 22 Feb 2001. [S343] E-mail from Paula Payne to Stuart & Teresa Pask dated 4 March 2009. [S285] Website FamilySearch Internet (http://www.familysearch.org) : Batch No. C095691. [S2463] Baptisms Registers Transcript, Wolvesnewton, Monmouthshire: "INCORRECT ENTRY Isaac Pask, parents Isaac & Mary at Lanmartin. Birth Date 27 March 1820; Baptised 29 March 1820 [with twin sister Susan] - should read Susan the daughter of Isaac Pask and Elizabeth Pask of the Parish of Llanmartin was born on 28th February 1820 and was baptized 29th March 1820 by David Thomas of Nebo Independent Chapel Wolvesnewton." [S343] E-mail from Paula Payne to Stuart & Teresa Pask dated 13 June 2010. Notes from Nebo register: Isaac the son of Isaac Pask of the Parish of Llanmartin by Elizabeth (Stephens) his wife was born on 27th March 1816 and was baptized 29th March 1820 by David Thomas of Nebo. [S343] E-mail from Paula Payne to Stuart & Teresa Pask dated 13 June 2010. Notes from Nebo register: Mary Ann the daughter of Isaac Pask of the Parish of Llanmartin by Elizabeth his wife was born in February 1817 and was baptized January 7th 1820 by David Thomas of Nebo. [S2463] Baptisms Registers Transcript, Wolvesnewton, Monmouthshire: "INCORRECT ENTRY Isaac Pask, parents Isaac & Mary at Lanmartin. Birth Date 27 March 1820; Baptised 29 March 1820 [with twin sister Susan] - should read Susan the daughter of Isaac Pask and Elizabeth Pask of the Parish of Llanmartin by was born in 28th February 1820 and was baptized 29th March 1820 by David Thomas of Nebo Independent Chapel Wolvesnewton." [S343] E-mail from Paula Payne to Stuart & Teresa Pask dated 4 March 2009: Susan the daughter of Isaac Pask and Elizabeth Pask of the Parish of Llanmartin by was born in 28th February 1820 and was baptized 29th March 1820 by David Thomas of Nebo Independent Chapel Wolvesnewton. [S343] E-mail from Paula Payne to Stuart & Teresa Pask dated 13 June 2010. 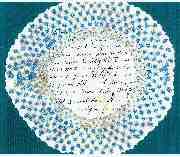 Notes from Nebo register: Susan the daughter of Isaac Pask or the Parish of Llanmartin by Elizabeth his wife was born in 28th February 1820 and was baptized 29th March 1820 by David Thomas of Nebo. [S781] E-mail from Pat Maybrey to Stuart & Teresa Pask dated 11 January 2007. [S3161] Website Llanmartin Parish Record Transcripts (http://freepages.genealogy.rootsweb.ancestry.com/… ) Burials: Ruth Sadler, Landevaud 1 Apr 1856 65. [S781] E-mail from Pat Maybrey to Stuart & Teresa Pask dated 11 January 2007: From Genes Reunited - Nicola Symonds. [S3161] Website Llanmartin Parish Record Transcripts (http://freepages.genealogy.rootsweb.ancestry.com/… ) 9 April 1826 Jas & Mary children of Edward & Ruth Sadler, Landevaud, labr. [S3161] Website Llanmartin Parish Record Transcripts (http://freepages.genealogy.rootsweb.ancestry.com/… ) 26 Feb 1832 Eleanor d/o Edward & Ruth Sadler, otp, labr. [S6] Teresa & Stuart Pask's Guesses, Theories and Speculations: Burials: Tabitha Sadler, otp 6 Jun 1840 10wks. [S3161] Website Llanmartin Parish Record Transcripts (http://freepages.genealogy.rootsweb.ancestry.com/… ) 14 Sep 1843 Albert Edward s/o Edward & Ruth Sadler, otp, labr. [S3161] Website Llanmartin Parish Record Transcripts (http://freepages.genealogy.rootsweb.ancestry.com/… ) Rachel Paske, otp 9 Mar 1830 62. [S3161] Website Llanmartin Parish Record Transcripts (http://freepages.genealogy.rootsweb.ancestry.com/… ) Burials: Rachel Paske, otp 9 Mar 1830 62. [S4] GRO Indexes to Deaths. "1871/Q2 Newport, M. 11a 210 age 77." June 1 1864 Rebecca Hodges age 31 female wife of James Hodges, Llanmartin labour of Llandevaud and Caerleon. Medical certificate signed by W W Hoyan and sent by authority of Geo. Pope J.P.
County, Union, or Parish to which chargeable: Newport Union. Form of mental disorder: Dementia with Paralysis. Supposed cause of insanity: Organic disease of Brain. Bodily condition: in feeble bodily condition. Duration of attacks: 3 ,age on first attack 28. Date of death: 25 April 1865 certificate informal. First attack has lasted 3 years, not epileptic, is at times excited threatening has had some symptoms of paralysis of right side. About a year ago bore a child. Mental delusions, speaks of her deceased father in one moment as living, in another as if dead. Once threatened to kill her husband with a reap hook. Exposes her person, then laughs, screams or scolds any person present, and talks ramblingly of her dead children. On admission seems in feeble bodily condition, is very incoherent and doesn’t apprehend questions readily. July 9 has much improved in strength and is less demented. Jan 1865 14 rather more feeble is still however stout. April 15 has been confined to bed for several weeks and shows a tendancy to bed sores still being rather stout, for a week past has taken very little food and has a large swelling of left Paroted Gland. Apr 25 sank and died today at noon. [S3] GRO Indexes to Marriages. "1850/Q3 PASK, Rebeka Newport, M. 26 139." [S285] Website FamilySearch Internet (http://www.familysearch.org) : The information is incorrect - the correct information is as supplied by Kay M Hodges. [S2475] E-mail from Kay M Hodges to Stuart & Teresa Pask dated 25 February 2006. [S2475] E-mail from Kay M Hodges to Stuart & Teresa Pask dated 28 February 2006: resource: certified copy of an entry of marriage, Application number P.A.S. 151118/51. Marriage solemnized at The Register Office, district of Newport in the counties of Monmouth and Glamorgan. No. 179 sixth day of July 1850 James Hodges age 22 Bachelor labourer, Llandevaud,father James Hodges, rank or profession of father, smith. Rebeka Pask 19 years, spinster, Llandevaud, father Isaac Pask, rank or profession, mason. Married in the Register Office. this marriage was solemnized between us, the mark X of James Hodges the mark x of Rebeca Pask in the presence of B. Samuel and William R. Potter. [S2475] E-mail from Kay M Hodges to Stuart & Teresa Pask dated 25 February 2006: RESOURCE:Film #0415449 British Mission Records, James Hodges Sr. emigrated in 1866. He was in the ward or branch LLandyfod,Herfordshire,conference. He was baptized a member of the Church of Jesus Christ of Latter-Day-Saints 11 Aug 1850 by Issac Pask at the age of 21 years. Also his wife Rebecca was baptized a member of the Church of Jesus Christ of Latter-Day-Saints 11 Aug 1850, this same day by Issac Pask, her father. James Hodges was ordained an elder by Henry Naish 17 Mar 1851 book #162 pg 2a line 1. This information researched by Kermit L Hodges.this date 8 Aug 1994. [S1848] Website Yahoo Groups - MONFH Monthmouthshire Family History (http://groups.yahoo.com/group/monfh) : Message 10951: Simon wrote "...she died in 1866 & then her husband JAMES "joined" The Church of Jesus Christ of Latter-Day Saints & went to USA, sailing on the "St Mark" from Liverpool to New York on 6 June 1866 ticket no. 655. Arrived 26 Jul 1866. Left on Nebraska wagon train on 8 Aug. Arrived Salt Lake Valley on 8 October 1866, but he had died on the way". They had a son JAMES (Jnr) HODGES in 1852 who married EMMA STEDDAR." [S2475] E-mail from Kay M Hodges to Stuart & Teresa Pask dated 25 February 2006: Rebecca entered the Pen-Y-Fal hospital 1 June 1864 and died there on the 25 April 1865 of general paralysis. This Hospital was at Abergavenny. [S2475] E-mail from Kay M Hodges to Stuart & Teresa Pask dated 25 February 2006: RESOURCE:Film 1565721 item 54 and 56 From Bethany Baptist, Llanvaches, Monmouthshire, England, B8 Headstone:In memory of Isaac Pask of the hamlet of Llandevaud who died 14 Feb 1864 age 71 years. Also Elizabeth wife of afore said died 22 May 1871 age 78 years. Also Rebecca Hodges daughter of afore said died 21 May 1865 age 34 years. (note:The certified copy, application number R006856 from the General Register office at Abergavenny in the county of Monmouth, copy of death entry clearly states 25 April 1865. and also the death date shown on hospital records shows 25 April 1865. )( Rebecca was buried 21 May 1865.) I checked with a Funeral Home to see if this was possible and they replied that it was common to take this long for a burial and that the body could be preserved for that length of time but would not be advisable to view the remains. [S2475] E-mail from Kay M Hodges to Stuart & Teresa Pask dated 25 February 2006: Resource: ref.CRO/C9/DJR/JR Gwent county council David J. Rimmer county Archivist obtained her death record. Refer to individual notes on Rebecca Hodges.researched by Kermit L. Hodges this date 15 Mar 1996. Thank you for your letter of 27 Febuary. I am pleased to let you know that the female case record book for the Joint Counties Asylum, now called Pen-Y- Fal Hospital, 1864-1868, which shows that Rebecca Hodges from Llandevaud, Llanmartin was admitted to the Hospital on the 1st. June 1864 and died there on the 25 April 1865. As there is no entry in the Hospital burial register Mrs. Hodges was not buried in the cemetery attached to the Chapel at Pen-Y-Fal. [S2475] E-mail from Kay M Hodges to Stuart & Teresa Pask dated 6 July 2007. [S2635] Digital Photograph & Transcription of Patient Register for Rebecca Hodges. Kindly provided by Kay M Hodges. [S2475] E-mail from Kay M Hodges to Stuart & Teresa Pask dated 28 February 2006: Resourse: film 1565721 item 54 Bethany Baptist, Llanvaches, Monmouthshire,England. 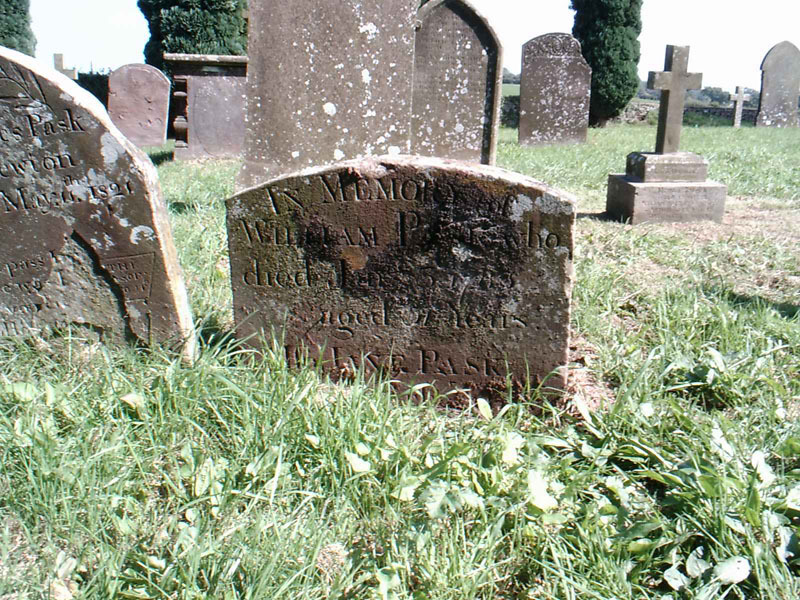 B8 Headstone: in memory of Isaac Pask of the Hamlet of Llandevaud who died 14 Febuary 1864 aged 71 years. Also Elizabeth wife of aforsaid died 22 May 1871 aged 78 years. Also Rebekah Hodges daughter of afore said died 21 May 1865 aged 34 years. ( note, the death entry record and also the Hospital records that she died on 25 April 1865). This resourse was found and sent to me by Marilyn Fisher of Birmingham, England on 8 May 1996. [S2636] Digital Photograph & Letter of Necklace of Rebecca Hodges. Kindly provided by Kay M Hodges. [S415] Website Ancestry Civil Registration - Births: 1852/Q3 HODGE, James Newport, M. 11a 156. [S2475] E-mail from Kay M Hodges to Stuart & Teresa Pask dated 25 February 2006: Isaac born 1853 lived 3 months died 1853. [S2475] E-mail from Kay M Hodges to Stuart & Teresa Pask dated 25 February 2006: Elijah born 1855 lived 5 months died 1855. [S2475] E-mail from Kay M Hodges to Stuart & Teresa Pask dated 25 February 2006: Elizabeth born 1852 lived 4 months, died 1852. [S2475] E-mail from Kay M Hodges to Stuart & Teresa Pask dated 25 February 2006: Mary born 1861 lived 2 months died 1861. [S343] E-mail from Paula Payne to Stuart & Teresa Pask dated 4 March 2009: Isaac the son of Isaac and Elizabeth Pask of the Parish of Llanmartin was born on 27th March 1816 and was baptized 29th March 1820 by David Thomas at Nebo Independent Chapel Wolvesnewton. [S485] Image of the 1881 Census for Llanmartin, Monmouthshire: RG11 Piece 5260 Folio 23 Page 7. [S417] Website Ancestry Civil Registration - Marriages: "1843/Q3 PASK, Isaac Newport, M. 26 125 = THOMAS, Mary." [S384] Website FamilySearch Internet (http://www.familysearch.org) : Baptism: PASK, Richard 10 May 1848 of Llandevanl, Monmouth Parents: Isaac PASK and Mary THOMAS. Record submitted after 1991 by a member of the LDS Church. [S588] Copy of the marriage certificate of Augustine Pask and Jane Parry, 20 November 1886. Kindly provided by Paula Payne. [S482] Image of the 1891 Census for Llanmartin, Monmouthshire: RG12 Piece 4370 Folio 62 Page 5 . Indexed incorrectly under the name of PATH or PARK. [S4] GRO Indexes to Deaths. 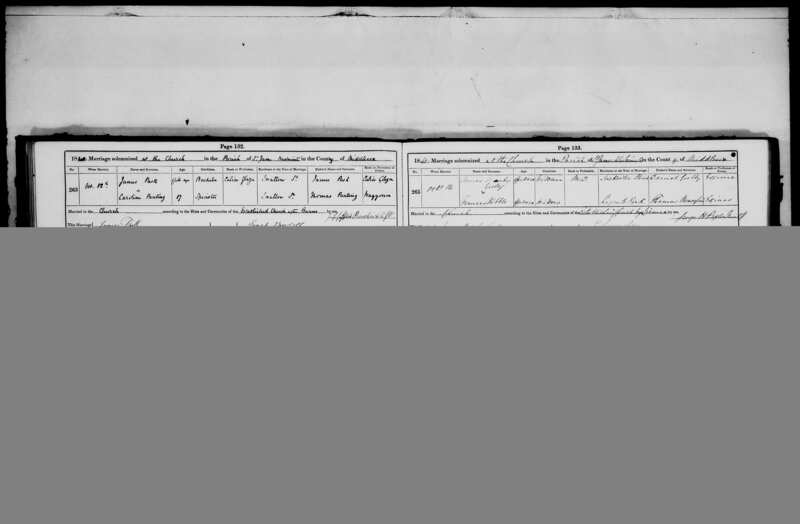 "1891/Q3 PASK, Mary Newport, M. 11a 100 age 69." 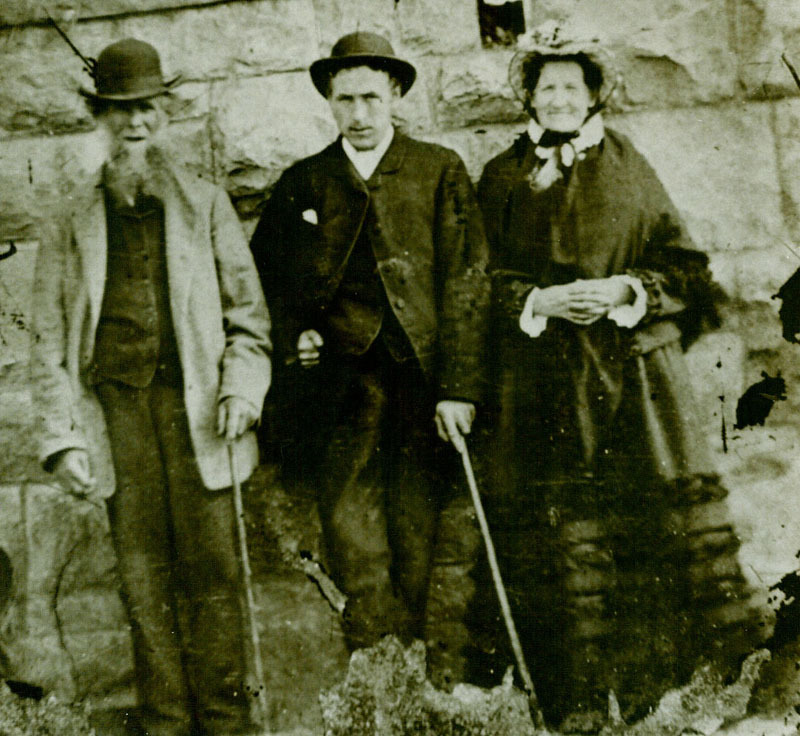 [S1168] Scanned photograph of Isaac Pask and two unknown people. Kindly provided by Paula Payne. [S4999] Website UK Government Probate Search Service: 1896: PASK Isaac of Llandevaud Llanmartin Monmouthshire mason died 24 October 1895 Probate Llandaff 23 March to Isaac Pask mason Effects £56 19s 6d. [S4] GRO Indexes to Deaths. "1895/Q4 PASK, Isaac Newport, M. 11a 93 age 79." [S5] Website Miscellaneous http://www.cefnpennar.com/llandevaud/stpeters.htm - In / memory / of Isaac Pask / of this hamlet / who died Feb 14th 1884 / aged 71 years / ... / Also of / Richard Thomas Pask / who died May 23rd 1923 / aged 75 years / Peace perfect peace. Includes a photograph of the gravestone. [S343] E-mail from Paula Payne to Stuart & Teresa Pask dated 13 June 2008. [S2] GRO Indexes to Births. "GRO Online Index: 1844/Q3 PASK, Caroline Ann THOMAS Newport 26 91." [S2] GRO Indexes to Births. "GRO Online Index: 1846/Q3 PASK, Elizabeth THOMAS Newport 26 131." [S2] GRO Indexes to Births. "GRO Online Index: 1848/Q2 PASK, Richard THOMAS Newport 26 118." [S2] GRO Indexes to Births. "GRO Online Index: 1849/Q2 PASK, Mary THOMAS Newport 26 120." [S2] GRO Indexes to Births. "GRO Online Index: 1851/Q4 PASK, Elizabeth Jane THOMAS Newport 26 93." [S343] E-mail from Paula Payne to Stuart & Teresa Pask dated 27 August 2004. [S2] GRO Indexes to Births. "GRO Online Index: 1854/Q2 PASK, Isaac THOMAS Newport 11a 169." [S3161] Website Llanmartin Parish Record Transcripts (http://freepages.genealogy.rootsweb.ancestry.com/… ) 17 May 1883 Augustine Thos s/o Isaac & Mary Pask, Llandevaud, stone mason. [S2] GRO Indexes to Births. "GRO Online Index: 1864/Q2 PASK, Augustine Thomas THOMAS Newport 11a 189." [S343] E-mail from Paula Payne to Stuart & Teresa Pask dated 4 March 2009: Mary Ann the daughter of Isaac Pask and Elizabeth Pask of the Parish of Llanmartin was born in February 1817 and was baptized January 7th 1820 by David Thomas at Nebo Independent Chapel Wolvesnewton. [S344] E-mail from Philip L Fletcher to Stuart & Teresa Pask 24 February 2004. [S1663] Image of the 1851 for Ewerby, Lincolnshire: HO107 Piece 2101 Folio 151 Page 1. 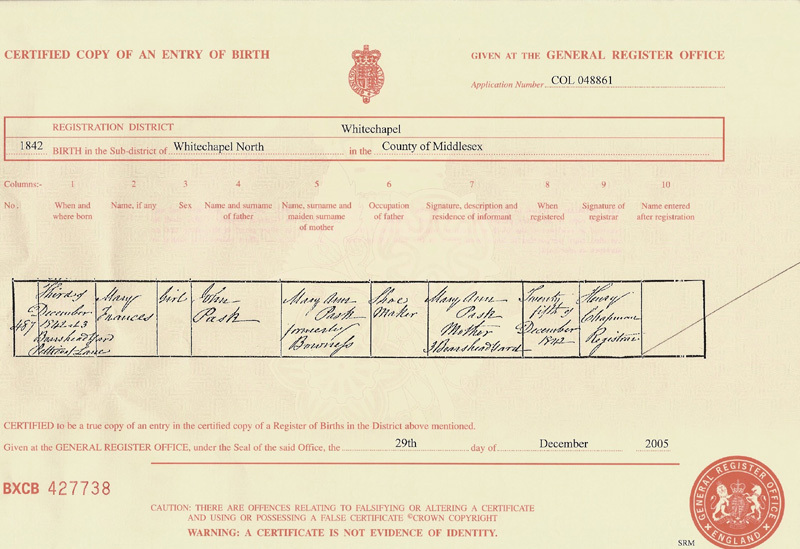 [S567] Parish Registers Transcript, Wellingore, Lincolnshire "Baptism: William PASK s Joseph & Elizabeth; Born 1 Jan 1802." [S384] Website FamilySearch Internet (http://www.familysearch.org) : Batch C034202: Gives date of birth as 7 January 1802. [S384] Website FamilySearch Internet (http://www.familysearch.org) : Batch C034202. [S344] E-mail from Philip L Fletcher to Stuart & Teresa Pask dated 23 November 2005: Philip writes "A list of William & Bridget (Massey) Pask and their children is in the possession of Russ and Shirley (Brown) Bachman, it says William Pask married Brigit (Malsey) March 11, 1824. It also says Brigit died December 10, 1843." [S1662] Image of the 1841 Census for Ewerby, Lincolnshire: HO107 Piece 618 Book 10 Folio 9-10. [S4] GRO Indexes to Deaths. "1843/Q4 PASK, Bridget Sleaford 14 347." [S344] E-mail from Philip L Fletcher to Stuart & Teresa Pask dated 23 November 2005: Typed Brown & Pask History images. [S344] E-mail from Philip L Fletcher to Stuart & Teresa Pask dated 24 February 2004. [S285] Website FamilySearch Internet (http://www.familysearch.org) : Batch No: C028861. [S270] Website Rootsweb World Connect: Jacky Clark (http://worldconnect.rootsweb.com/cgi-bin/igm.cgi). [S384] Website FamilySearch Internet (http://www.familysearch.org) : Batch C028862. [S27] Website National Burial Index (NBI) @ FindMyPast (www.findmypast.co.uk: ) 21 Dec 1843 Bridget PASK 38 Lincolnshire Ewerby, St Andrew. [S5508] Website FindmyPast: Lincolnshire Parish Registers 1538-1911: St. Andrew's Church, Ewerby Burial 21 December 1843. Baptism 5 March 1826 Amelia Alice daughter of William & Bridget Pask of Great Hale, a Shoemaker. [S4] GRO Indexes to Deaths. "1847/Q2 Sleaford 14 376." [S4] GRO Indexes to Deaths. "1847/Q2 PASK, Amelia Sleaford 14 376." [S27] Website National Burial Index (NBI) @ FindMyPast (www.findmypast.co.uk: ) 5 May 1847 Amelia PASK 21 Lincolnshire Ewerby, St Andrew. [S5508] Website FindmyPast: Lincolnshire Parish Registers 1538-1911: St. Andrew's Church, Ewerby Burial 5 May 1847.